The flower bud of Eugenia caryophyllata Thunb. of family Myrtaceae, which is called Gong Ding Xiang. Guangdong and Hainan provinces of China. Collected in the period of September to March of the next year when the flower buds turn green into red. Heavy aroma, pungent and numb the tongue. Big, red-brownish, heavy with strong fragrance. Pungent, warm; spleen, stomach, lung and kidney meridians entered. Warm middle energizer and check adverse flow of qi, dispel cold to alleviate pain, warm kidney and reinforce yang. 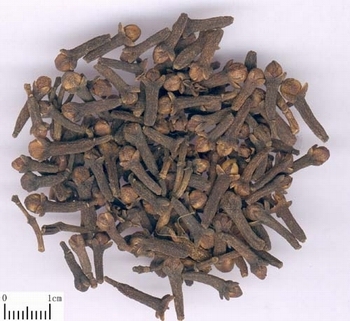 It has the actions of warming middle energizer and dispersing cold, so it is good at checking adverse rise of qi to arrest vomiting and stop hiccup and is the essential herb for vomiting and hiccup due to stomach cold. It is usually combined with the herbs of warming middle energizer, tonifying qi and checking the adverse rise of qi. For vomiting due to deficiency-cold, it is combined with Shi Di, Ren Shen and Sheng Jiang. For instance they are used together in Ding Xiang Shi Di Tang from Zheng Yin Mai Zhi. For vomiting, diarrhea and poor appetite due to deficiency-cold of spleen-stomach, it is usually combined with Bai Zhu and Sha Ren. For morning sickness, it is combined with Ren Shen and Huo Xiang from Zheng Zhi Zhun Sheng. It has the action of dispersing cold to alleviating pain. For gastro-abdominal cold pain, it is combined with Yan Hu Suo, Wu Ling Zhi and Ju Hong. It has the actions of warming kidney and reinforcing yang. For impotence, soreness and pain of waist and knees due to deficiency of kidney-yang, it is combined with kidney-yang-warming herbs such as Fu Zi, Rou Gui and Yin Yang Huo. It is incompatible with Yu Jin (nineteen incompatibilities). It should be used with cautions for heat syndrome and yin deficiency with interior heat.